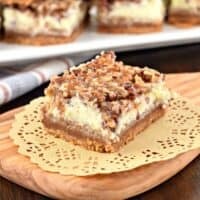 The layers on these Pecan Pie Cheesecake Bars are incredible! One tasty bite and you’ll fall in love! It’s seriously hard to believe Thanksgiving is this week, and suddenly Christmas is only a month away! I love this time of year. I just wish it would slow down a little bit! If it were my decision, I would put my Christmas decorations out on November 1st, because I want to enjoy the season as long as possible! And let’s face it, once Christmas is over, it just becomes a chore to put everything away. However, my husband is all about ONE HOLIDAY at a time. No decorations before Thanksgiving. Fortunately, I’ve got all my kids on my team, and we secretly sneak items onto coffee tables, end tables and our mantel. This year though, BONUS, my husband traveled for work last week. Our motto was, “when Scrooge is away the family will play.” We pulled out ALL but the Christmas tree. haha, surprise!! I’m married to a wonderful man, he took it quite well. Actually, I think maybe he liked that he didn’t have to help. But, we are hosting Thanksgiving in our house, so I do have to hammer down and focus on that holiday (even though my house is decorated for Christmas). I blame it all on blogging. We start recipe testing peppermint recipes in July you guys. I’ve got Valentine’s recipes under my belt for 2016. The struggle is real. Needless to say, these Pecan Pie Cheesecake Bars are the perfect THANKSGIVING treat. Or any holiday really. 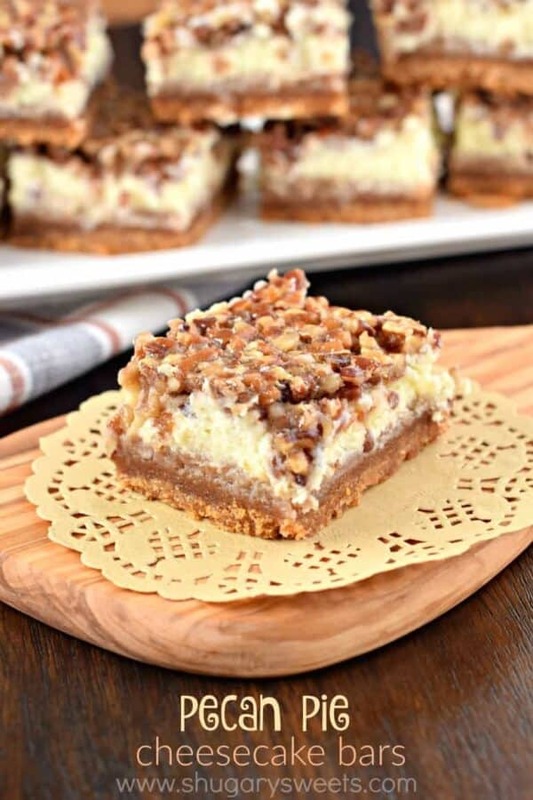 They are layered with a thick graham cracker crust, creamy cheesecake center and then topped with a gooey, caramelized pecan pie layer (made with Karo light corn syrup) on top! 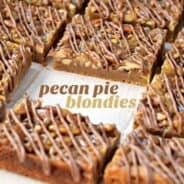 My partnership with Fisher Nuts has been so fun, and I hope you guys will enjoy seeing these nutty recipes for another year here on Shugary Sweets! I love using Fisher Nuts as they are one of the only brands that are preservative free! Be sure to scroll down after the recipe to see some of my favorite Fisher Nut recipes, as well as visiting the Fisher Nut Pinterest board for more recipes from my fellow bloggers! 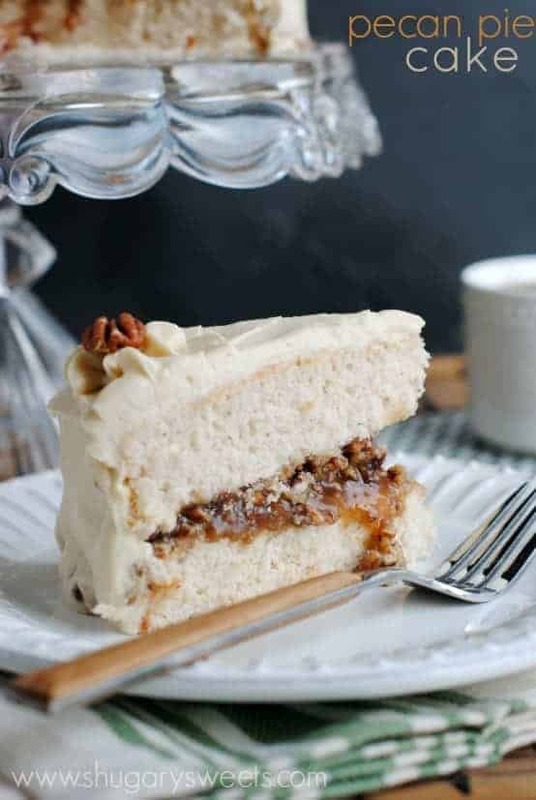 Pecan Pie Cake: a sweet layer cake with a pecan pie filling and brown sugar frosting! 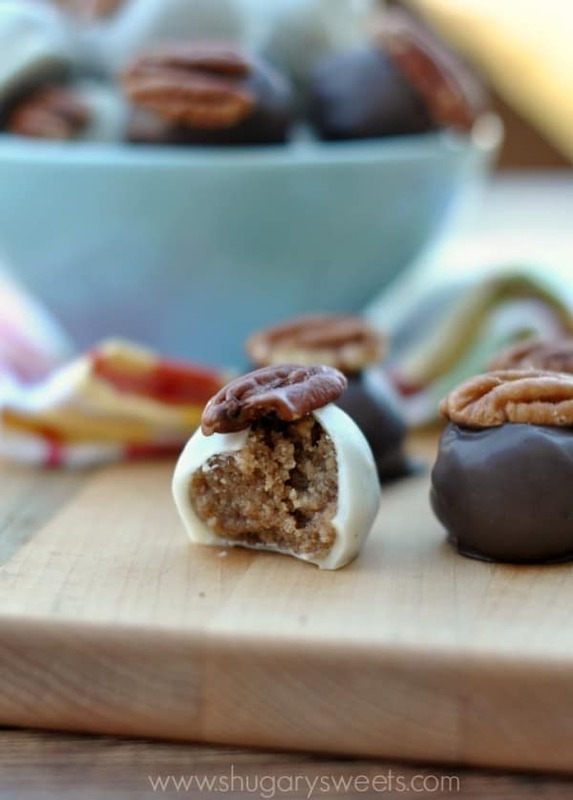 Pecan Pie Truffles: as amazing as they sound! Butterscotch Pecan Sandies: little bites of heaven. My favorite cookie to give for the holidays! Line a 13x9 baking dish with parchment paper. Set aside. For the pecan pie layer, heat brown sugar, KARO corn syrup, cream, butter and salt in a small saucepan over medium heat. Bring to a boil. Stirring constantly, boil for 1 full minute. Remove from heat and add in vanilla and chopped pecans. Allow to cool slightly then pour slowly over cheesecake layer, using a spoon to pour it over so it doesn't sink to the bottom. Bake bars in a 350 degree oven for 35 minutes. Remove from oven and cool completely. Today’s recipe was originally posted on November 23, 2015 and has been republished in November 2018. My dad and I used to use my mom’s business trips as an excuse to eat stuff she wouldn’t allow in the house, and our motto was pretty much the same as yours: when the cat’s away, the mice will play! I’m glad your husband took it well. Mine wouldn’t have even noticed, so score one point for a husband who sees the house is different! These look incredible. 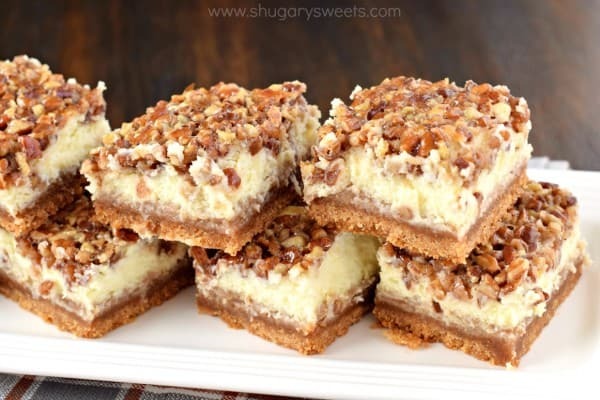 I’m all about cheesecake bars, and I’ve been enjoying all the Fisher’s recipes! Glad there are more to come! I’m the same way! I’ve been sneaking Christmas decor out since Halloween – but surprise surprise! My husband is WAY into it this year and I’ve had to stop him from putting the tree up! Love the bars! I’m thinking I may skip the cheesecake I had planned for Thanksgiving and make these instead! We were just having the same discussion this weekend. As I was putting away the Halloween stuff, I asked if I could just get the Christmas stuff out now. The whole family vetoed it! 🙁 These Bars are PERFECT for Thanksgiving and for feeding a crowd! I don’t think there could be a more perfect dessert than cheesecake and pecans! These are just gorgeous!! Fisher Nuts are the best! These look amazing! I’m not usually a fan of nuts, but I think I need to try these out! Oh my these look delicious Aimee! 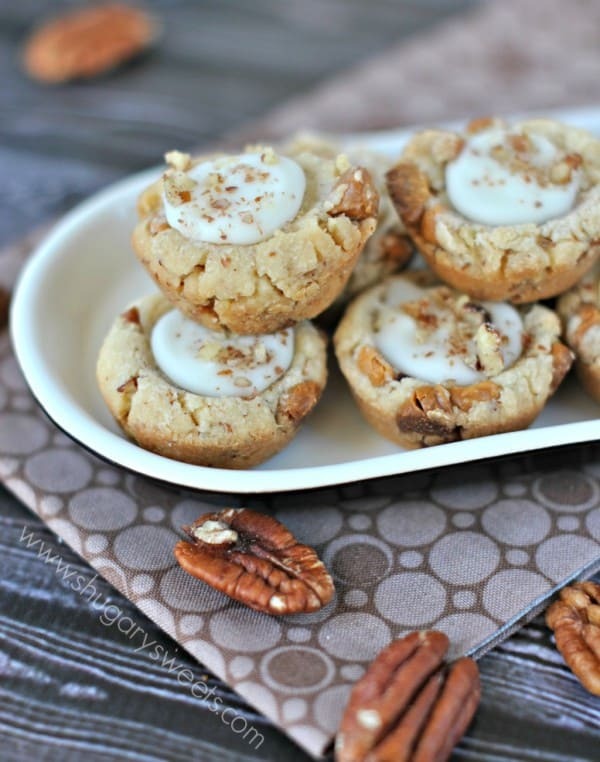 I’m a huge pecan pie fan, so I know I’m going to LOVE these! Thanks for sharing and Happy Thanksgiving! Oh these look outstanding! Love the combo. Ha, we just stuck our toes in the water the other day, one little decoration. Jordan’s been chomping at the bit! Also, why have I never made cheesecake pecan pie before? AMAZING. DO IT. Haha. I can’t imagine Christmas with no snow. For us, as soon as the weather gets chilly and the first snow falls, I’m ready. There is so much to love about these gorgeous bars! Love the pecan pie and cheesecake combo – amazing! Pinned! I’m with your husband on the one holiday at a time, Aimee… My kids were in a Christmas parade last Saturday downtown. Just felt like it should somehow be a Thanksgiving parade… These bars look over the top amazing. I have a similar recipe minus the cheesecake. But that cheesecake….. wow! He’ll be happy to hear there are people on his side on this one 🙂 My entire family is nuts and he’s alone in his views, haha!! I need these in my life, today. And I love that you put your tree up while your husband was gone — too funny! Ben would probably be happy about avoiding that tastk too. I’m so impressed you already have Valentine’s Day recipes ready! I need to get on it! The layers on these bars look soo incredible! I’m afraid I might be a bit of a scrooge!! I hold off on Christmas cheer until the day after Thanksgiving! Whoops 🙂 These bars look like the PERFECT Thanksgiving treat (LOVE that you used a graham cracker crust here.) YUM. 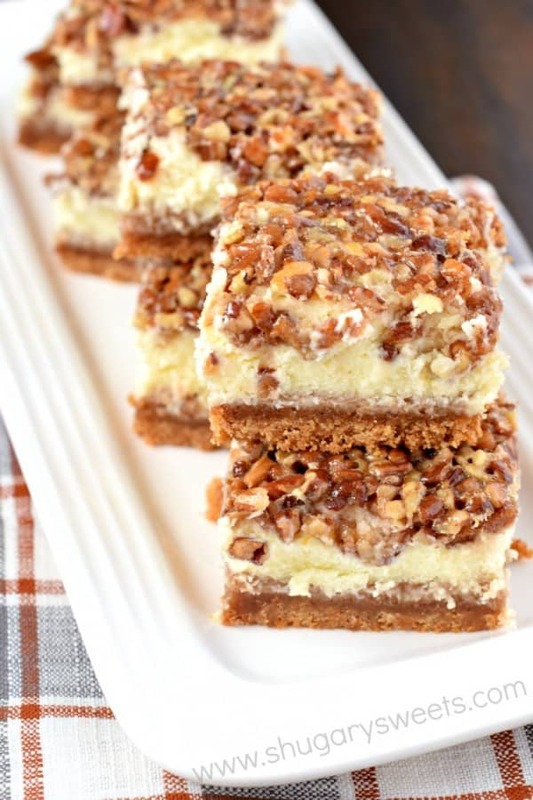 Forget pie, I want these cheesecake bars for Thanksgiving dessert! Oh my! These looks scrumptious! Oh my that looks so good!! I love love love cheesecake anything!! This recipe is a keeper. 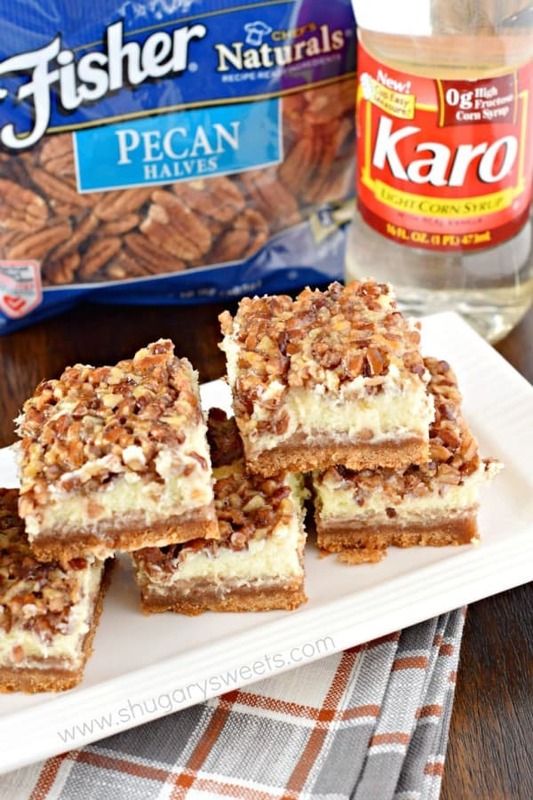 Oh my, if you like pecans and you like cheesecake this is THE recipe!! Thanks so much. I know this will be a hit on the Christmas buffet. @Jess it looks like there is a layer between the crust and the cheesecake layer. I’ve been trying to figure that out before attempting to make these because your are right it is be a very expensive dessert to fail. I know my comment is really late…..but I want to make these for the 4th of July. My best guess is that you have to let the hot Carmel pecan layer cool before you pour it over the cheesecake layer. Has anyone else made this recipe? 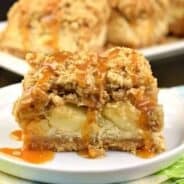 What is the substitute for pecan if it is not available? These are so amazing – have made them twice now. But I have had such trouble with them sticking to the parchment paper. Any tips or suggestions? Would this happen if you don’t whip the cheesecake layer til “fluffy”? I’ll find out soon, because I want to make this for Christmas. Mine did the same thing. What went wrong? If anothee batch is made, can the leftovers be frozen? Does the recipe REQUIRE the use of kosher salt, or could I replace with a different kind of salt? It’s the one thing i totally forgot to pick up at the store and didn’t realize until the day of planning to make them! You can use table salt….but use half the amount I listed for kosher. Kosher salt is more coarse. Would love to make these but don’t have a food processor. can it be done another way? You can either buy the already crushed graham cracker crumbs (they come in a box in the baking section), or you can put your crackers in a ziploc bag and crush them yourself with a meat tenderizer or skillet. Or you can use a blender to crush them! 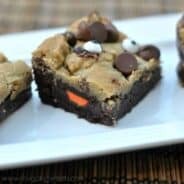 Would love to make these but don’t have a food processor. Can it be made another way? Made these last night for a Thanksgiving work party. They turned out incredible!! My pecan pie layer didn’t set up as well as yours did in the picture, it’s a bit runny, I think I needed to add more Pecans. Still amazing, thought! Will definitely make again! This recipe looks delicious! I would like to double the cheesecake part. Do you have any suggestions for how much extra time I night need to cook It? I made this for Thanksgiving dessert. It was a huge hit. Would one be able to freeze these bars? I made this recipe and I won the dessert contest at my husband’s company Christmas party. The best part…the prize was $50 cash! Thank you shugary sweets! These are a new favorite at my house. Thank you so much for the recipe! What is heavy cream?To be mixed in the pecan layer.? Thats the part I’m confused on? I slightly cooled my pecan layer and placed on the cheesecake with a small spoon but it sunk in the cheesecake layer. It is in the oven now. I know it won’t look good but I tasted the pecan layer and it tasted great. I’m just disappointed as I could not have done it any more careful. I’ll be making these but will also do a pie. Some of my guests don’t eat nuts, likely because of false teeth, so I have to accommodate all. When my kids were young, I put up some decorations, however, Santa Claus ALWAYS brought the decorated tree. Putting tinsel on the tree one strand at a time made a beautiful sigh5, but also a very tired mommy! Any ideas on how I managed to mess this up? I made two batches and planned to take one to potluck but now have to find something else to bring, as this stuff is too messy. If I try again, I think I will use the springform pan and line it with foil, as suggested above. Then at least I can try to peel the foil instead of scraping stuff out… 🙁 Or maybe line both sides and bottom with foil, to allow flipping over and peeling. Anyway, sounds from comments that I am not the only one who struggled, so please update the recipe. Follow up — I was able to get bars out, phew…. just could not salvage one side of each pan, just a few. Lesson learned — line bottom and sides. Bars are delicious!!! Thank you for this delicious recipe! This was the first time I made a dessert that was not cookies or a snack cake. I followed your directions almost entirely (I missed the part about chopping the pecans). It came out perfect! Pecan Pie Cheesecake Bars were the hit of our Thanksgiving dinner! My grandson even asked for the recipe, the highest of compliments. Your creation is now a part of our traditions. Thanks so much! Love to hear this, thanks!! !